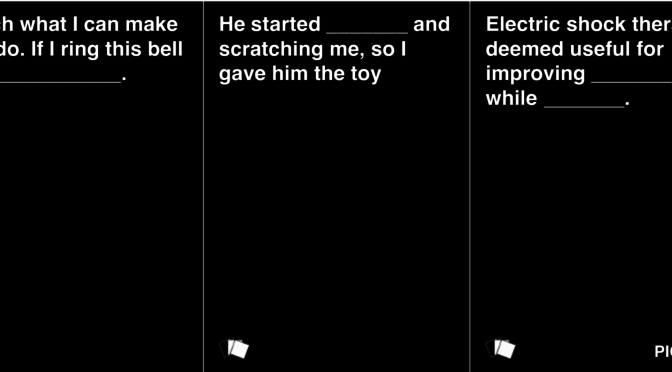 Cards Against Humanity is a game whose own creators describe it as, “a party game for horrible people.” The game has been extremely popular, with several official and unofficial expansion packs available. Recently, a group of behavior analysts decided to get in on the fun by making their own expansion pack. Unfortunately, the result is anything but fun. In fact, it makes light of several abusive practices that are not currently restricted by the Behavior Analyst Certification Board, the governing body for board certified behavior analysts all over the world. “Pinch the nose to release the jaw” isn’t funny when you’re on the receiving end of “feeding therapy” or having ammonia sprayed in your mouth as a punishment for noncompliance. The cards also included multiple references to physical restraint, electric shocks, and feces. NOS Magazine reached out to the original poster of the cards, Dr. Amanda Kelly, also known by her blogging moniker “Behaviorbabe.” Dr. Kelly has won multiple awards, including “Advocacy Group of the Year” from Autism Speaks. She also has made multiple videos about ethics and ABA. Dr. Kelly stated that she only posted the cards, and that she did not contribute to their creation. Rather, they were the creation of a group of students. She also stated that she should have looked more closely at the cards and did not review them before posting. When asked for more information on the students, Dr. Kelly stated that she did not know who those students were. Tobey Karpel, who is not a student but is in fact a board certified behavior analyst, was explicitly credited on Dr. Kelly’s page for the cards before they were taken down. NOS Magazine reached out to Tobey Karpel about her role, but she did not respond to our inquiry. Ms. Karpel did speak to Max Sparrow, an Autistic activist and advocate. She told Mr. Sparrow that she did not write the cards, but that they were a collection of comments posted in a private Facebook group for behavior analysts. she felt she was the victim of a ”witch hunt” and that the game was meant to help professionals like herself “blow off steam.” It is worth noting that Mr. Sparrow struggles with PTSD as a result of behavior therapy he received as a child. Before “Cardgate” I believed that there were many caring BCBAs, trying to do good from within a corrupt system. I still believe good people go into ABA with compassion intentions but the system breaks most of them. Some quit; some go on to work broken and leave many broken clients in their wake. The search for good BCBAs has begun to look like Abraham pleading with G-d to spare Sodom and Gomorrah if ten righteous men could be found there. I doubt we could find ten righteous BCBAs. I would welcome a metaphorical rain of fire and brimstone on the entire industry. That’s where I’m at right now: disappointment and disgust of Biblical proportions. Due to a string of deletions and the nature of private Facebook groups, the creators of the unofficial ABA expansion pack for Cards Against Humanity will probably remain unknown. Whether the ABA practitioner community is willing to honestly assess what “Cardgate” says about attitudes towards autistic clients remains to be seen. Thank you for pursuing this. I’m a Behavior Analyst who is horrified. I sent this link to our certification board, and asked for a quick follow up. Altieri (first published April 29, 2017). Applied Behavior Analysis (ABA) has a Terrible Timeline it will never publish and here it is. This post includes works of the “CounterControllers” to the ABA Controllers. And this is surprising… why? There’s no such thing as good ABA. It is fundamentally based on the idea that we are not people. It doesn’t take much to “uncover” their disrespect of us. Facebook WILL have a copy of the details of when this thread was modified, when posts were deleted etc whether or not they want to admit it. It will probably take a good lawyer to make them find and release that information, but, put it this way – if it was a series of posts that led to the perpetrator of a terrorist act or an assassination attempt on the president they could soon be made to reveal the data. Very unethical for Them to do that. Makes their profession like even worse then it already is. Goes aginest confidentiality. Disrespect for their clients. And they say that WE give ABA a bad name. No. ABA gives ABA a bad name. We don’t need “therapy,” but we do need to learn how to adapt as well as possible to the neurotypicals and their strange, illogical ways. However, they also need to learn how to adapt to us. It’s about time they begin to take into account those whose brains function in different ways.